I’ve always thought the “A film by” credit was unwarranted. Take any film, imagine it being made with a different cinematographer, editor, composer, production designer, costumer, much less a different cast, and you’ll have a completely different film no matter who’s directing it. There are a number of films you could say the same about if you had a different location scout. Sometimes a location affects the look of the entire film. It can dictate the look of the stage sets. It can set the psychological mood of the story. A good location scout can bring so much to a film that very few people will ever realize. 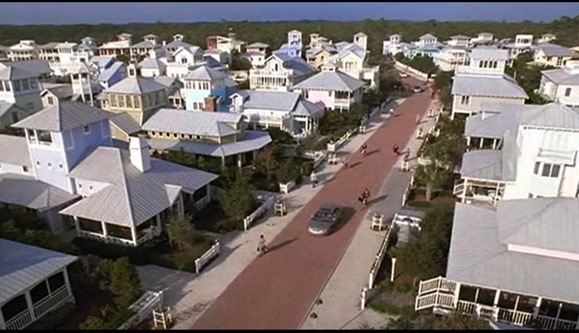 The Seaside Community in Seagrove Beach, Florida which served as the main setting for the film The Truman Show. In 2000 I was working on one picture where the head of locations was trying to find a house that set up the story. He found three houses that he believed would all work for the setting. The director mulled them over but said he wanted to see more choices. Every week he and is team would scour the town looking for the perfect house, talking to the owners, doing a full photo survey of each which consisted of photographing the house in and out, processing the film with 4 copies of each frame ( this was pre-digital) and then taping the photos into manilla folders including the long taped-together panorama shots. These folders soon filled file boxes. A lot of them. Someone from the studio called up wondering how we could have spent over $10,000 in film processing. We told them to come look for themselves. Criterion has released a new edition of the 1997 film, The Ice Storm, (a film I didn’t work on). In this video from the Criterion site, Production Designer Mark Friedberg talks about the importance of finding just the right locations that would convey the psychological picture of each of the families. All content on this site, including electronic text, image files and other materials are protected by copyright laws and may be covered by other restrictions as well. Randall Wilkins retains all rights, including copyright, of data, image, text, and any other information contained in these files. Copyrights and other proprietary rights to the material on this website may also be held by other individuals and entities as well and are noted. Except in the case of Fair Use Laws, permission for any use of these materials must be requested from the author. In the case of Fair Use, please attribute any republishing of materials to this website.